This past Sunday we hosed easter lunch for the hubs family. 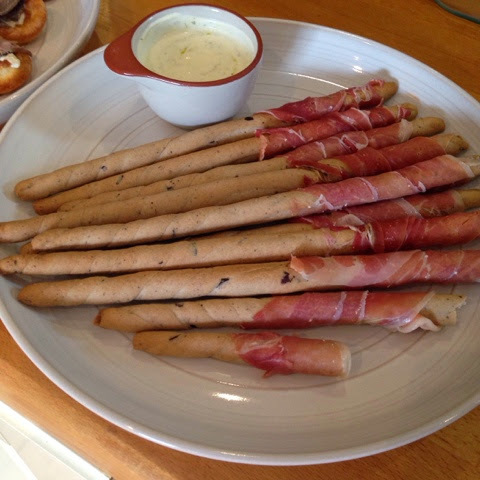 Generally, if we are having a roast dinner, we don't usually have a starter but as we had guests I thought I'd better make an effort. When I cook a meal like this, it's planned to military precision and so if I say it's going to be on the table at 3.30pm, it's served pretty much within 10 mins (unless I have a major crisis eg no electricity or oven malfunction!). There's no secret to this, it's simple planning and executing that plan. 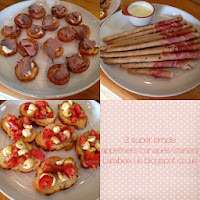 I'm putting together a blog post on that subject which should be ready next week, now back to the starters. Just for a plan B I like to have a back-up to save stress on the day and if dinner was half an hour late then my guests wouldn't be starving and my stress levels wouldn't be soaring!! For this lunch I wanted a few canapés I could serve as an appitizer/starter but I wanted quick and simple but impressive as the hubs brother is a bit of a foodie. 2. 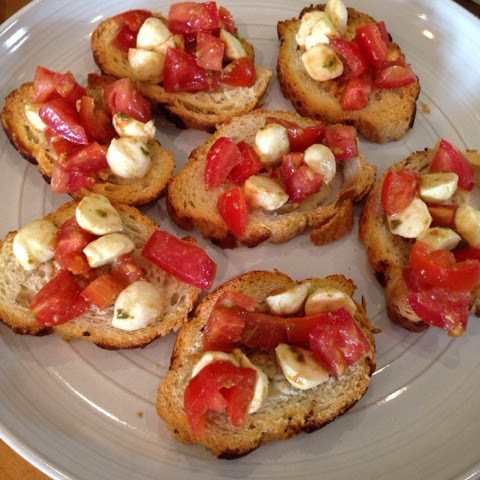 Lightly toast the bread slices in a hot oven for 10 mins or until lightly golden. 3. Just before serving pile the bread with tomato mixture. The yorkshires can be made in advance (I made mine 2 hours before needed) 1. Pour sunflower oil halfway up each cup of a mini muffin tin, place in a hot oven for 10mins. 2. Meanwhile mix batter well, once oil is smoking, pour a tiny amount of batter into each cup. 4. The Yorkshire puddings should start to rise, some maybe a little bigger than others, place on kitchen paper to mop up the oil. 5. Mix the horseradish and creme fraiche together, put to one side. 6. 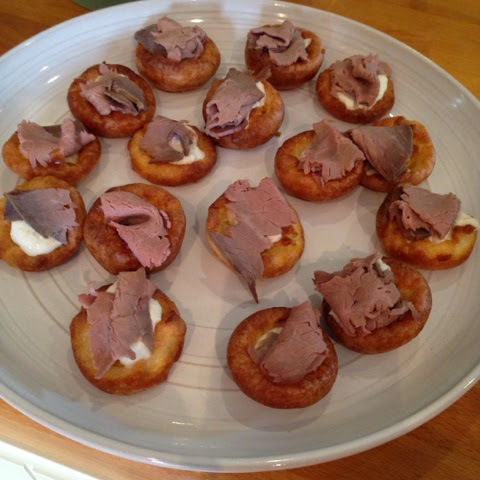 Just before serving, put half a spoon on horseradish cream onto the Yorkshire and top with beef. 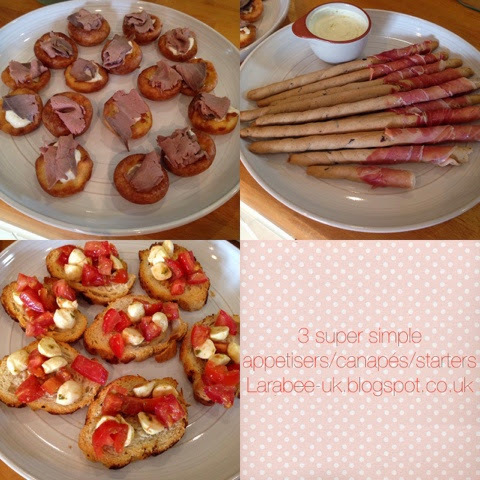 There you go, 3 nice and quick but impressive canapés, ours went down a treat. 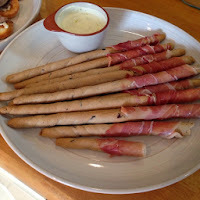 I'll certainly be making these again, maybe even for a light supper if we have friends round for drinks. Hope you are having an enjoyable day, St George's activity planned for tomorrow.